As a child, he always dreamed of being a doctor. He has always had a passion for helping those in need in the most innovative way. In his earlier years as a doctor, he had a passion for emergency medicine and helicopters. 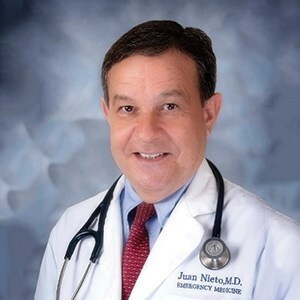 Dr. Nieto worked with EMS and developed Air Life in Greecey, CO and San Antonio, as well as creating Star Flight in Austin. Dr. Nieto also enjoys teaching. He served as an Associate Professor at UTHSC for 15 years. After his career in academics, he started working in free standing emergency rooms.